39 EUR (morning), 49 EUR (day), 69 EUR (evening). Here we come again – the most hedonistic Champagne and sparkling wine parade in the Baltic countries! Join us in tasting more than 100 champagnes and 50 sparklers, meet the most passionate Champagne lovers, chat to producers and chef de caves, listen to the advice of Latvia’s leading sommeliers and importers, and just enjoy a great morning/day/night out at the Museum! 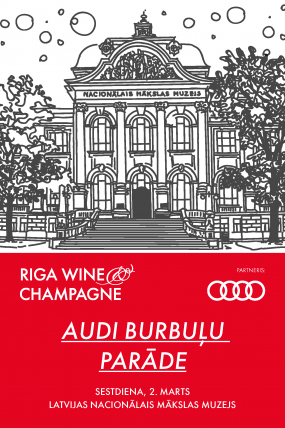 On March 2, 2019, Audi Bubble Parade will sparkle at the National Arts Museum’s Main Hall! Please choose morning, day or evening session!